Supplied in Re-Sealable packs containing 6 x 25g (150g) packets of grain that deliver a lethal dose in just one feed! The grain sachets are formulated with hazelnut attractants and various mulched cereals making them irresistible to rodents! Ideal for use in sensitive areas and designed to be used in an Elixir Rat Poison Box/station which once safely secured can be used in areas where children and pets may occasionally be present. MADE FOR USE BY THE PUBLIC – You won’t have to worry about hiring an expensive professional to sort out your infestation. RATATAK is made for home use and is readily available for the public. RATATAK Bromadiolone Grain sachets are formulated with hazelnut attractants and various mulched cereals making them irresistible to rodents & increase target rodent uptake! 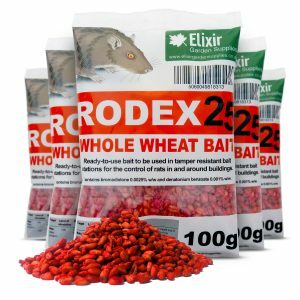 RATATAK Bromadiolone Grain is designed for use in anti-tamper Bait Boxes making it ideal for use in sensitive areas where children and pets may occasionally be present. The sachets can be pierced by the metal rod supplied with the bait stations and then fixed in place, this not only prevent non target animals consuming the poison but allows you to quickly gauge how much poison has been taken. For best results it is recommended you place the poison along the edge of walls, fencing or near sites of activity such as holes or burrows created or dug out by rats and mice. One packet is so potent it can potentially kill 2 rats. They are safe to handle and are very easy to use with a rapid and high success rates. Particularly effective in gardens around where wild birds are being fed – an attractive site for rodents. Also useful for around stable yards and farms where rodents are an inevitable pest. Mice – The bait stations should be visited at least every 2 to 3 days at the beginning of the treatment and at least weekly afterwards, in order to check whether the bait is accepted, the bait stations are intact and to remove rodent bodies. Re-fill Bait when necessary. Rats – Place the bait stations in areas non-liable to flooding. Replace any bait in a bait station in which bait has been damaged by water or contaminated by dirt. The bait stations should be visited only 5 to 7 days after the beginning of the treatment and at least weekly afterwards, in order to check whether the bait is accepted, the bait stations are intact and to remove rodent bodies. Re-fill bait when necessary. Remove food which is readily attainable for rodents (food waste, spilled grain). It is important that you do not clean up the infested area just before treatment as this only disturbs the rodent population and makes bait acceptance more difficult to achieve. Bait stations should be placed in the immediate vicinity where rodent’s activity has been observed (travel paths, nesting sites, holes and burrows). When using the product do not eat, drink or smoke. Wash hands and directly exposed skin after using the product.